A portion of Jacinto St. between A.M. Regidor and Legaspi Streets is the so called Calle Budin of Tayabas, Quezon where you can buy budin (cassava pudding) and other Quezon specialties e.g. 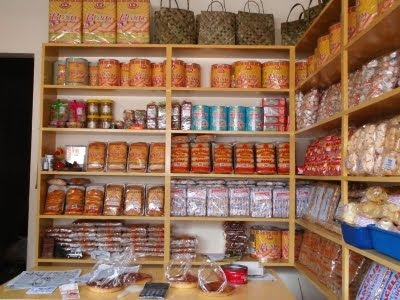 broas (ladyfingers), nilupak, pancit hab-hab (pancit lucban) noodles, tikoy, Lucban longganisa (pork sausage Lucban style), pinagong, sometimes pinais, lambanog (plain and flavored) as well as pasalubong products from nearby Laguna towns e.g. 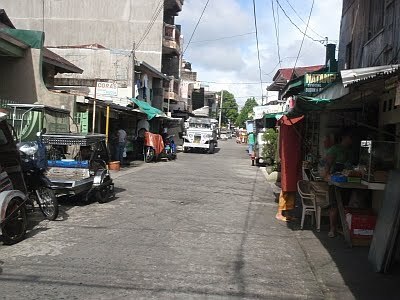 espasol, puto seko, shing-a-ling, uraro et al. 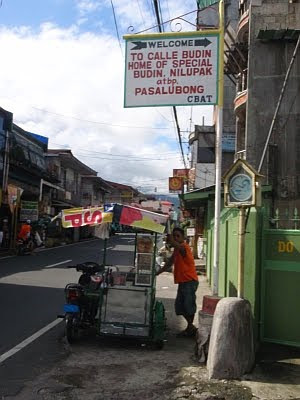 Calle Budin sign at the corner of Legaspi and jacinto St.
Tutubi hurriedly bought 5 budin at a cost of P28.00/piece (good for 2-3 persons), a large can of Campville broas at P140.00, a small pack of Campita's tikoy at P40 each, plus a small bottle of lambanog (distilled coconut wine). yummy, i've never had pancit habhab before.